The Stradwick House by Space Division is clad in brick on the base, and a cedar rainscreen covers the top level. Pendant lamps by Moooi are suspended from the double-height ceiling. Marc Lithgow custom designed the American oak kitchen cabinets. The floors, and the ceiling above the lounge, are whitened maple. Made from anodized aluminum, the mechanical louvers surrounding the master bedroom provide privacy while letting in light. 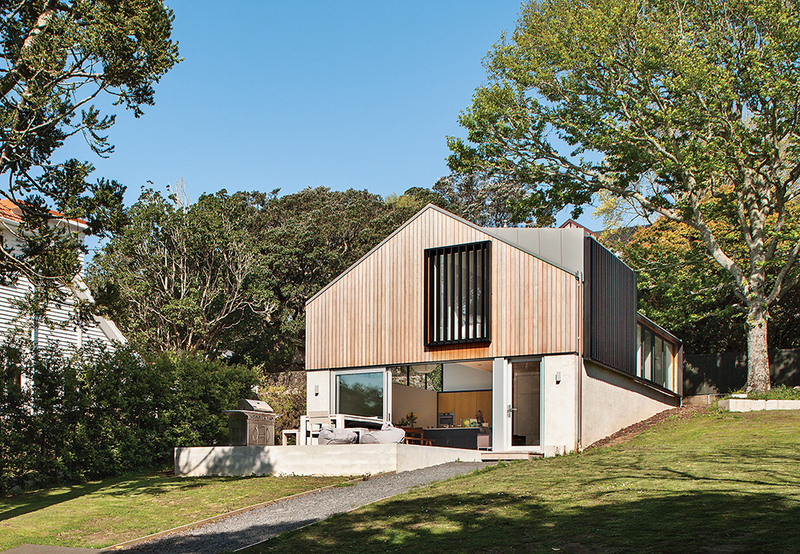 “It wasn’t your usual two-car garage,” says Space Division’s Marc Lithgow of the 1980s brick structure that occupied a sloped lot next to a white wooden manor in the leafy Auckland, New Zealand, suburb of Mount Albert. Thirty years on, Lithgow’s clients—a builder, his wife, and their two children—bought the land along with the garage. 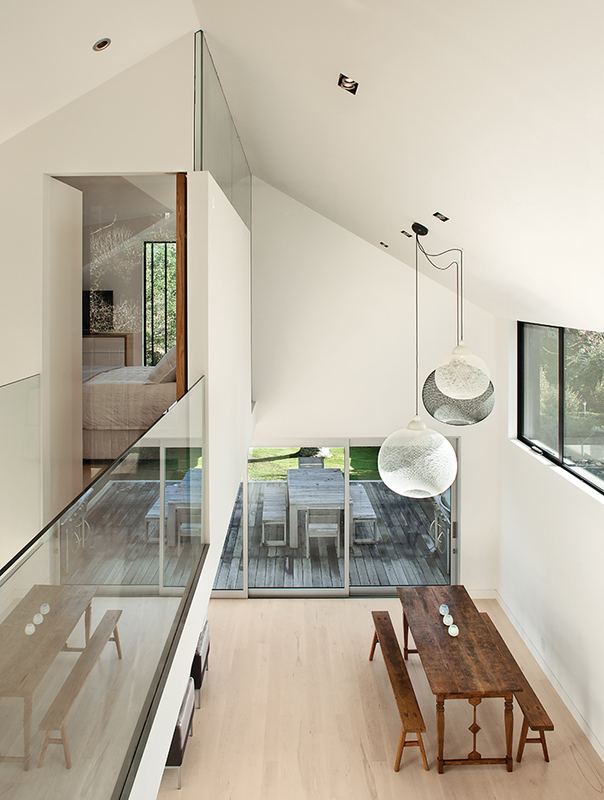 They requested an efficient, modest-sized family home and wanted to move quickly, so Lithgow opted to use the existing structure, which had been dug into the slope. Rigorous local planning laws would have made building from the ground up difficult. By also using the original foundation, Lithgow completed construction of the new 1,300-square-foot house in just nine months. He peeled off the roof of the garage and stripped the brick walls, adding large windows and a gable roof to create a second story in the eaves. Downstairs is an open-plan living space along with two bedrooms and a bathroom; upstairs is a loft-like master bedroom, plus an office and another bathroom. The layout resembles a Rubik’s Cube in its technical precision. The two bathrooms are stacked on top of each other next to the main stair; downstairs, the shower slots underneath the stairwell where the ceiling cuts away on an angle. Throughout the house, the clutter of family life disappears inside oak-faced cabinetry, while technical aspects such as the heating system are squeezed into the narrowest of recesses.